Well now, a headache inducing exercise early in the morning this most certainly is. What a glorious bunch of submissions for this first challenge of 2017, and as I have viewed each image during the week, words like awesome, wow, that’s superb, have frequently been uttered. Other words like abdicate or ask another Forumite or moderator to stand in for you, have also made an appearance . I suspect that I should offer an apology for making life difficult, as I gather that for some, choosing your best for 2016 is not easy. Still, the choices submitted are wonderful, the variety just so special. I am daunted by the task of judging this one, and seeing that I am no expert in this, I offer some thoughts with fear and trepidation. I am inviting my friends Muesli and yoghurt to assist me this morning . As usual, the two basic standards of judging are employed-what does it tell me of the photographer (eye, technique, composition etc.) and what impact does the image have on me (emotional, inspirational, motivation). Pipinmels–Klausenpass-Cracking opening image, excellent on so many levels, superb contrast, light and color. Composition is wonderful, fixing the attention on that tree while there is sufficient space to appreciate the DOF of that icy background. Well worth your while to have stopped. Great photographer’s eye coupled with photographic skill. Welcome to the tree-loving-mass-of-photographers. Your contribution is most welcome . Davidtrout –Scotsman at speed –one of those images that fill me with envy, as I would love to take a shot like this, but it alludes still to the present. Excellent composition and the unmistakable feel of the energy of this train. Almost half the image is taken up with that smoke, but what impact it has overall. Timing and positioning yourself for this shot was not doubt deliberate. That bit of red in an otherwise monotone image is magical! Mag07-Niedzica Castle – One of only two images in this challenge that received “likes” from fellow forumites, two of them, a sure testament that this is a highly regarded image here. It’s wonderful, and stirs up the wanderlust. Elements of mystery and not surprised that it is a favourite place. I want to hear about those tales, as long is its not of the Dracula ilk. All the elements of a solid image are here, composition, DOF, and wonderful atmosphere. AndrewA- Pain attack- I’ll wager the band and your friend were very happy with this, an emotive well-crafted image, with the B/W adding a lot of impact. I suspect that for many, there will be a connecting resonance with this image. Though the eyes are mere dark patches, they convey the sense of pain very well. An unusual portrait shot! Perspicador-Chaffinch-well now, I am happy to have my pants charmed off. As a bird lover, you instantly get kudos from me, but also for a fine image, well composed and crafted image. Appreciate the patience in capturing this. Reminds me of a Christmas card really, warm and nostalgic. Color rendition is spot on, and I simply love that (intended?) halo. Garethjmorgan –There is always a price to pay- you may get a call from anti-tobacco lobbyists for this one. The other image that received a “like”, not surprising, and to coin a word from my young people “its hectic” on so many levels. Wonderfully composed, lovely range of color on this urban scene, with great DOF that does not distract from the main subject. Great textures too! But oh, the message of the dangers of smoking is wonderfully emphasised, with a juxtaposition between the life out there that is on offer, represented by that pedestrian? and the damage done to those lung damaging stuff. Imho, this is a wonderful journalistic image. Oh, and I love Graffiti. Pentaxis- Deep Purple – A bit of fine nostalgia which we all love. Beautifully composed, sharp as a pin, and that purple is enough to make anyone fall in love with purple again. DOF is great, and glad you included those open bonnets in the background. But I am intrigued by that bending fella- whatever is he doing, looking at something else, when there is a beautiful beast to inspect. MikeInDevon-Exeter Cathedral west façade-Angel detail- What a great shot, loaded with textures of the nicest kind, suitably sombre and atmospheric, and as intended, the details are fantastic. Personally I would have removed the background pillars, to enhance the angel, but its fine as is, giving some context to the image. Wonderful play on light and shadows The Helios is legendary, and here employed in the hands of a skilled photographer. 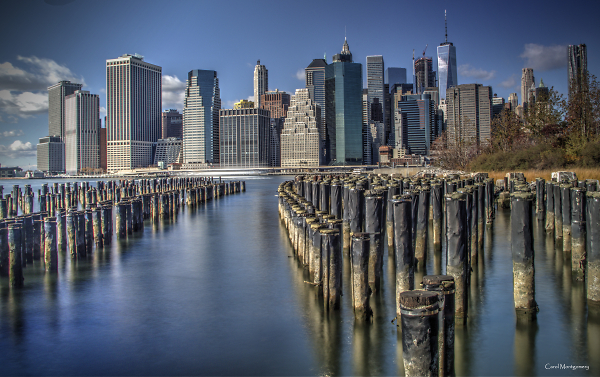 Carol8345- Manhattan Landscape-One of the images that got a wow from me, for several reasons. Beautifully composed, sharp, attention grabbing DOF, color and amazing details. The low angle has enhanced the skyline of this familiar city. Another postcard, travel brochure worthy image. The fact that it is a familiar subject has not daunted this photographer from attempting yet another, and done with aplomb. Those pillars in the water are intriguing, water fountains I presume. Like JohnRiley’s image, fit to be proudly used as your wallpaper on your PC. Paulb531-La Gacilly-France – Well I had better not say anything about the quirky French . Well spotted and equally well captured. I like the quirkiness of this image, Japan comes to France yes. DOF is really good here, vibrant colors and such a lot to explore. But those folks on the banks is what intrigues, seemingly so too for that pedestrian on the bridge? They’re oblivious to the quirkiness. Would love to be there too! Ninorubino- A cloud of dust on the meadow- Well done, such an appealing minimalist image, with wonderful use of light and capturing that dust requires skill. A lovely calming inviting country image, inviting a picnic, complete with chicken and all. Nice touch that that titbit of backlit leaves giving some context. Tonir-The Day after the storm- Turneresque indeed, wonderful to look at in full screen. You have captured a lot of drama here, as comes only from those dramatic storms that South Africa is famous for. Wonderful colors, stunning composition, DOF and landscape. I like the gentle curve of the earth here, and sense of scale. And of course the sense of the battle between nature’s power and human endeavours! Great shot. Abe_Normal-Noon on bare mountain- And yet another wonderful landscape image, and dramatic sense of scale, and as with the previous image, well worth viewing on full screen. Wow, the devastation is palpable and emotive for any tree lover. DOF, color and composition are all spot on with some amazing details. For me there is a deep sense of loneliness in this image, created by the devastation of nature and those somewhat forlorn folk walking that long road. Love it! Davidwozhere-Irn Bru- another image that invited a Wow from me, stunning! Excellent composition, DOF and details are simply wonderful, not to mention the appealing red. I read somewhere that besides being a primary color, red is also the most liked and easily identified one- and that has been utilised to the max here. Symmetry and architecture are well loved subjects that appeal to many, and add an element of mystery-where does this lead, let me explore-and you have a contender. Skilled photographer! Vic Cross- Baptism in the Jordan River- Superb documentary shot here. A bit busy, but of the nice kind, inviting exploration and appreciation. Whites are very well handled here, as it can be difficult to get right. Interesting expression on all those waiting their turn-anticipation, joy, and even anxiety. Appreciate the composition and angle this was taken from, religious events are notoriously difficult to capture. Details are wonderful, as is the DOF. And appreciate your timing choice on this- there are other options you could have captured, such as the moment that the baptised person emerges from the water, but you have opted to capture him/her still under the water-leaving an element of mystery and intrigue. Well done! JAK-Mole in a hole – Oh excellent! On so many fronts, not least for the patience and timing on this one. Image of a mole are a rarity, and just to have captured one is a feather in the cap. Sharp and detailed where it is needed, and details are excellent- just look at the roots, the texture of the soil is palpable and those claws. Add some contrasting color bokeh and you have an image to be justly proud of! Composition and color spot on! Simonmac-Winter sun –this is an awesome urban image with wonderful details, conveying an ordinary day in the city of Birmingham. The flare from the sun is fantastic and contrasts very well with the icy conditions. Composition too is great, and the chosen angle has given opportunity to capture much of the street and buildings. For a winter scene, there is a wonderful range of color here. But it’s the light falling on the top of the buildings that makes this magical! Well spotted, good photographers eye. I like the long shadows too- they add a lot of character. Dromfit-Jaws-The only true macro shot of the challenge. For a macro shot, this has wonderful details and better than usual DOF. Focus is spot on (on the jaws) and does create a bit of scare but that is soon taken away by the detailed description that it is a friend of gardeners. Great colors, and appreciate that that was not easy, especially if there are color changes as it moves. Super textures on the beetle and its environment. 2nd spot - Davidwozhere for that appealing red curves. 3rd place –JAK-for a rare image of a Mole. HC’s to Mag07, Davidtrout and Pipinmels. Congratulations. And thanks to all the entrants-all inspiring and humbling stuff. Thanks too for the headache-someone please remind me not to win again. Congratulations to Carol, davidwozhere (he seems to get everywhere) and JAK for exceptionally fine podium appearances. I had Carol's down as the winner in my own mind. Thanks for my HC and well done to Mag07 and Pipinmels on their HCs. Above all many thanks and congratulations to Noel both for the subject and the amazingly detailed comments. If we ever have a 'Best Judges Comments' competition Noel would surely win for this detailed, perceptive and highly entraining essay. A real tour de force. He made it difficult for himself by choosing a best picture of 2016 subject - it guaranteed every entry was going to be worthy of a win. Wow! I am honored to have my image chosen as winner up against so many other amazing photos. Thank you Noel, (and friends) for outstanding comments. I agree with you judging these is a very difficult task. As my favorite goes, I had Mag07 and David chosen in my mind, both are subjects that I may never get the opportunity to photograph, those were both stunning photos. Jaks your mole was awesome, such detail that I cannot seem to obtain with the equipment and the technical skills that I have.....Someday, I hope. I'll just keep trying. Congratulations to Carol and other podium places. I thought it was between Carol and Mag. The foreground made the difference in Carol's shot, just superb. What an excellent job by Noel. The judging and feed back was of the very highest standard. Definite congratulations to Carol, I really like that photo too. So many great images, glad I wasn't judging this lot! DavidWozHere's passageway too caught my eye, an everyday subject really well seen. David T's Flying Scotsman is good too; while not his fault it's sad to see it needed what I guess is a Class 47 diesel hanging on at the back, memories of the bad days for 4472. At least the right loco was at the front on this occasion! Mag's entry too; that was certainly eye catching and I wondered how I could ever match it. Pipinmels tree looks quite 3D on my monitor, super. So to be included anywhere amongst those is much appreciated, thank you. I could go on as all the images were truly fabulous but Noel's already done that. So thanks to him for the timely best of competition and detailed comments. I presume the internet connection problem was resolved. Look forward to Carol's task when she's thought it up. Congratulations to the winners. You had a tough job!!! I had many more then one favourite and would find it really difficult to no jsut award first place to few people. Well done Carol and all the other winners and honorary mentions. Cheers for mine and thank you very much for super comprehensive, thoughtful comments. Happy New Year! Great images, great winners, great judging, a really great start to 2017! Thanks Noel. David T's Flying Scotsman is good too; while not his fault it's sad to see it needed what I guess is a Class 47 diesel hanging on at the back, memories of the bad days for 4472. At least the right loco was at the front on this occasion! Yes I quite appreciate that, shame its needed though. When the Scotsman was doing its Scarborough-York runs before the overhaul it had to have the diesel as it couldn't get sufficient steam power to haul the services so it bring back memories of that. They don't seem to be doing that diesel backup with other heritage services though, or not that I've noticed and I'd have thought 4472 was fit enough now to be reliable again not to need the extra work hauling the diesel! I wasn't criticising your photo, that's superb! Blimey ... I wrote the comment before reading the judging and never realised I got a place. Thank you Noel, and congratulations to JAK for that lovely mole. Thank you for the competition and your lovely judging Noel.